Covers the more unusual members of the Starfighter operator family. Some subtypes not easily available. 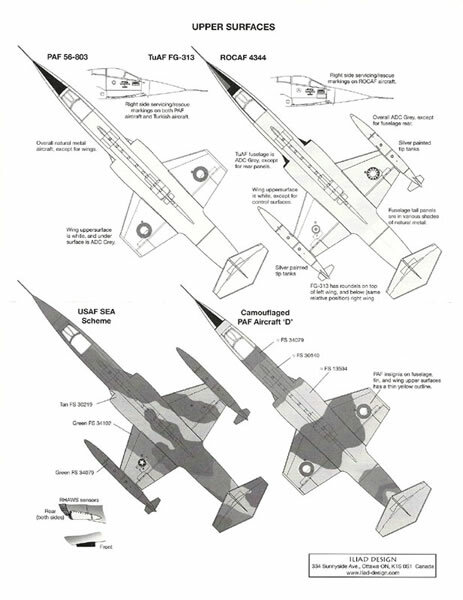 A sheet that provides a range of interesting USAF and foreign operated Starfighters that I have not seen depicted elsewhere. A nice alternative to kit supplied decals. As a bonus all the subjects have combat histories. The name of this sheet gives away what is the most interesting about this new sheet from Iliad Design. 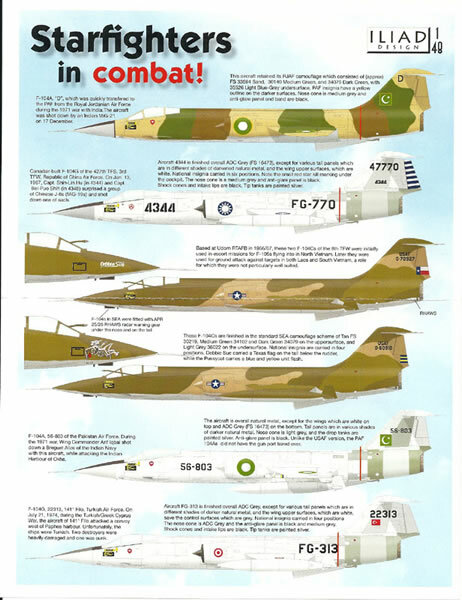 Each of the six F-104s from the four Air Forces depicted on this sheet were used in combat and add significant interest compared to a run of the mill F-104. F-104 “D” of the Pakistani Air Force during the 1971 war with India. This airframe had been transferred from Jordan and still carried that country’s desert camouflage. It was shot down on 17 Dec 1971 by an Indian MiG-21. F-104G 47770 of the 427th Fighter Squadron of the Tawainese Air Force. This aircraft was one of four that intercepted and shot down two PLAAF J-6 (MiG-19) aircraft on January 13 1967 for the lose of one F-104. It carries a small red star below the cockpit to mark the kill. F-104Cs 570927 and 560910. These two Starfighters served with the 435TFS, 8TFW at Udorn Thailand in 1966-67. Both these subjects are in US SEA Scheme camouflage and have interesting noseart. F-104A 56-803 Pakistan Air Force. This aircraft is cited by Iliad design to have shot down an Indian Navy Alize during the 1971 war with India, although other sources state this occurred during the 1965 war. F-104G 22313 141o Filo Turkish Air Force. This aircraft was involved in a friendly fire incident with a Turkish Destroyer was sunk during the invasion of Cyprus in July 1974. This sheet is typical of Iliad Design to my experience, with all the subjects on an A5 sheet and a double sided A-4 size instruction sheet. Colour profiles of all the subjects are given on one side whilst details of stencils, airframe modifications and camouflage schemes are in grayscale on the other. This is understandable given the cost of colour printing but as competitors are almost universally providing full colour instructions may impact on the attractiveness of Iliad Design’s product. The decals themselves are accurately and sharply printed having the feel of a Microscale product although this is not noted on the sheet. 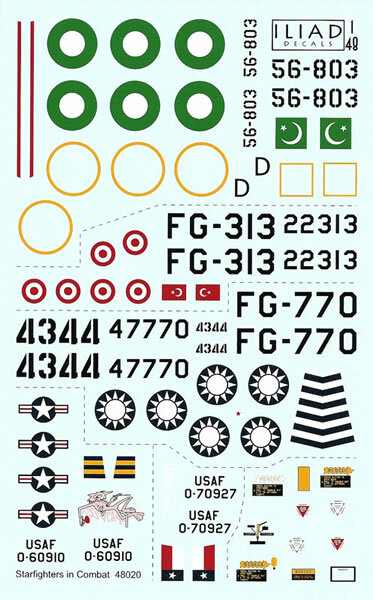 Complete decals for four of the six subjects with some markings being reused for the two USAF and two Pakistani subjects. In summary, this is an interesting set of subjects from Iliad Design and one I am sure to pursue. I am not sure on the availability of an OOB F-104A but the Hasegawa F-104C and F-104G kits will certainly provide a suitable canvas for these decals.